The leather bars did not migrate South of Market until the early sixties, when the Tool Box opened at Fourth and Harrison. The Tool Box was the prototype San Francisco leather bar. Located South of Market, it was wildly successful and became a focal point for a burgeoning community. Its walls were covered with murals by artist Chuck Arnett, whose work graced many other leather institutions over the years. A photo of the bar with many of the regulars standing in front of the Arnett mural appeared in Life magazine in 1964. When the Tool Box was torn down for redevelopment in 1971, old patrons salvaged souvenir bricks from the rubble. As the Tool Box faded in popularity, a wave of bars established Folsom between 7th St. and 12th St. as the symbolic center of the local leather community. Febe's and the Stud both opened at the western end of this core area in 1966. The Ramrod followed a few blocks east in 1968. A succession of bars came and went for the next two decades at 1347 Folsom, between 9th and 10th. The first bar there was called the In Between since it was between Febe's and the Ramrod. It was succeeded by the Cow Palace Saloon, a place that had no name, the Phoenix, the No Name (referring back to the unnamed place), the Bolt, the Brig, and finally, the Powerhouse. Another wave in the early seventies expanded leather territory south to Harrison and Bryant. The Bootcamp opened on Bryant in 1971 and the Ambush was established on Harrison in 1973. Other early seventies places included the Barracks (a bathhouse, not a bar) and the Red Star Saloon on the corner of Folsom and Hallam Alley. A third major wave crested between 1978 and 1983, and included the Black and Blue, the Arena, the Trench, the Cave, Headquarters, the Stables, the Eagle, and Chaps. Gay men wanting to live near the bars and attracted by the area's ambience had begun moving into South of Market after the opening of the Tool Box. Housing in the neighborhood was relatively cheap, and it had become more available as some of the older residents began to be displaced by the early stages of redevelopment. By the late 1970's gay men were a significant residential population in the area. 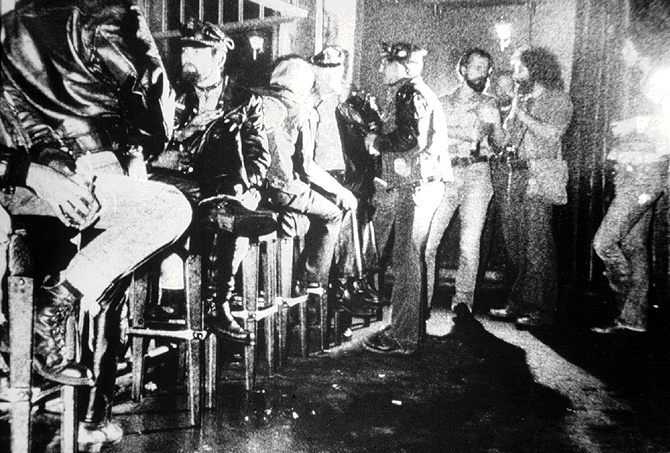 South of Market served gay men well as the "headquarters" of the leather community. It was centrally located. In the early sixties, rents were low and buildings cheap. At night, parking was plentiful. The atmosphere was ideal. The economy of the area was based on low rent commercial and light industrial use. Images of working class masculinity are central to leather iconography so the area's blue collar labor force was the stuff of fantasy. At night when the local businesses closed the streets were fairly deserted. The empty streets gave privacy and safety to men whose sexual activities drew hostility and sometimes physical attacks in more populated areas. As more gay and leather businesses located along the Folsom corridor, "South of Market, "Folsom St," or "The Miracle Mile," became a recognizably specialized zone of gay nightlife. Local columnist Mister Marcus coined nicknames for each of the major gay neighborhoods. He called Polk St. "The Valley of the Queens," Castro St. "The Valley of the Dolls," and Folsom "The Valley of the Kings." By the late seventies, the Valley of the Kings was one of the world capitals of gay male leather. It even began to attract heterosexual and lesbian sadomasochists and fetishists, who began to occupy the margins of the more established gay male leather world. They felt safe there.